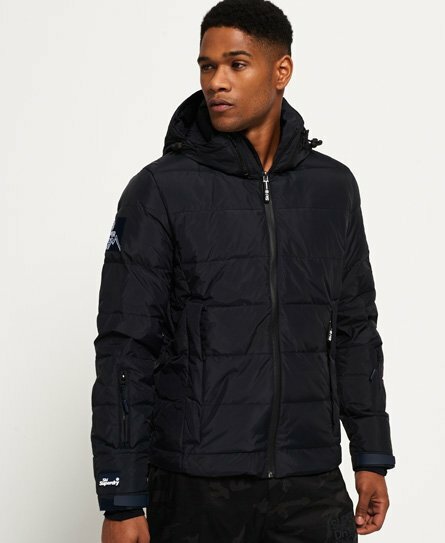 Superdry men’s Ski Command utility down jacket. The jacket has a 70/30 premium duck down filling for fantastic insulation, keeping you warm in extreme cold with a high fill power rating. The jacket features a detachable and adjustable hood with bungee cord adjusters, a single layer zip fastening and underarm vents. This jacket also has 4 zipped external pockets. On the inside of the jacket there is a single pocket with a popper fastening, an earphone cable routing system and a snow skirt. This jacket is finished off with hook & loop adjusters on the cuffs and thumbholes on the inner cuff lining and Superdry logos on the sleeves.